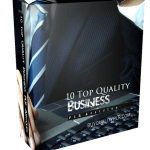 In this PLR Content Pack You’ll get 10 Top Quality Brick and Mortar Business PLR Articles and Tweets with Private Label Rights to help you dominate the Brick and Mortar Business market which is a highly profitable and in-demand niche. 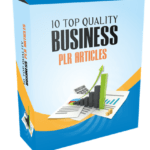 These Brick and Mortar Business PLR articles are available in Text file format and can be downloaded instantly after purchase. What Can You Do With This Brick and Mortar Business PLR? With the advent of online shopping, a lot of businesses have gradually started to feel the pain of losing customers in their bricks and mortar locations. Consumers have started to feel more confident about internet shopping and using their credit cards online. But not everything can be purchased online. There is still a range of bricks and mortar industries that are never going to go away because consumers need to physically go into the establishment. Here are some examples. People will always visit these for special occasions, when they are on vacation, or just when they are out and about and want to stop for a break and something to eat. The internet has made it easier for small establishments to attract customers through online delivery services such as Seamless and Grubhub. However, it also means they have to hire more delivery people and they won’t always get the profits usually associated with people who come in and order drinks, wine and cocktails. They are fast (as the name suggests), offer some pretty good price deals, and are a favorite with families on the go as a treat for the kids. Man (and woman) is a social animal. Bars will always be popular with those who like to hang out with friends or go to lively locations to meet people. This is definitely one of life’s essentials that can’t be done on the internet. These are two other establishments where you physically have to go into a bricks and mortar location in order to get what you need. Women who like getting their nails done will have to go to these bricks and mortar locations. 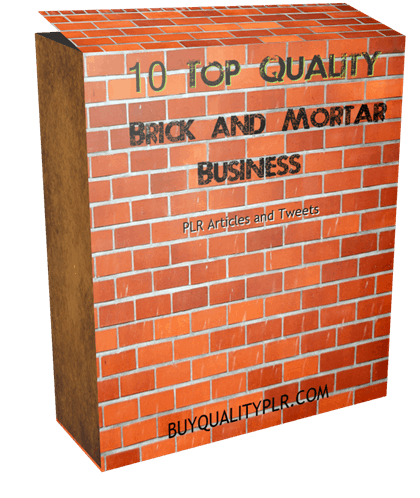 We will only be selling 50 copies on this Brick and Mortar Business PLR content pack, so don’t waste any time and grab your PLR license while it’s still available for sale.